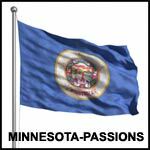 By voting on the books listed, you can help to determine whether a book is related to the theme of Minnesota-Passions, or whether it is a non-related, but popular, book among the members of the site. If you believe a book in the list below is 'on theme' with Minnesota-Passions, vote that it is relevant. (If you don't know, just skip it.) Over time, we hope to have a library of books that should be of interest to Minnesota-Passions members. Through this book we can see into the mind of the sage and share his most intimate reflections. ANCIENT EGYPT: THE LIGHT OF THE WORLD - A WORK OF RECLAMATION AND RESTITUTION IN TWELVE BOOKS by GERALD MASSEY, AUTHOR OF "A BOOK OF THE BEGINNINGS" and "THE NATURAL GENESIS"